The growth of traffic congestion in the road network of large cities in developing countries like Bangladesh is a serious concern in case of urban areas. The traffic congestion at the road intersections is most crucial because the performance of intersections affects the overall productivity of the whole road network most significantly. To reduce conflicts and ensure orderly movement of traffic at the intersections, it is a common practice to introduce different types of traffic control devices among which traffic signal is one of the most popular and effective controlling tool. The first traffic signal was installed in London in 1868 and used semaphore ‘arms’ together with red and green gas lamps. Unfortunately, it exploded, putting an end to this sort of control for 50 years in 1918 the first three coloured light signals were installed in New York . [8, road note 13] The first interconnected traffic signal system was installed in Salt Lake City in 1917with six connected intersections controlled simultaneously from a manual switch. The first automatic experimental traffic lights in England were deployed in Wolverhampton in 1927. US Patents for traffic control devices date back as early as 1909. Most of these devices involved semaphores or arrows to direct traffic, however a few included some kind of illumination source and lens systems that were similar to those used by the railroads. The modern electric traffic light is an American invention.As early as 1912 in Salt Lake City, Utah, policeman invented the first red-green electric traffic lights. On 5 August 1914, the American Traffic Signal Company installed a traffic signal system on the corner of East 105th Street and Euclid Avenue in Cleveland, Ohio. These devices were designed to assist traffic police at busy intersections. When the police officer signaled for a change in traffic movement, he would also change the color of the lights illuminated in the signal device. It had two colors, red and green, and a buzzer, based on the design of James Hoge, to provide a warning for color changes. The design by James Hoge allowed police and fire stations to control the signals in case of emergency. In 1920 William Potts, a Detroit Traffic Police Superintendent designed the first 4-way three-color traffic control device that is recognized as the basis for the modern traffic signal. Potts built what was basically a rectangular box that was divided into three stacked chambers. Each chamber was illuminated by a single bulb. Railroad signal lenses were affixed on each side of each chamber and the signal was suspended from a cable so it could be more readily seen by traffic. While the few traffic signals that already existed displayed only red and green colors, Potts’ added a yellow “caution” interval to warn motorists that the traffic signal was changing. Ashville, Ohio claims to be the location of the oldest working traffic light in the United States, used at an intersection of public roads until 1982 when it was moved to a local museum. The color of the traffic signals representing stop and go might be derived from those used to identify port (red) and starboard (green) in maritime rules governing right of way, where the vessel on the left must stop for the one crossing on the right. There has been little work in the traffic signal field from developing countries in general In Bangladesh so far only one extensive study in this field has been reported. The study was undertaken by PPK Consultants Pty Ltd, Australia in association with Delcan International Corporation, Canada and Development Design Consultants, Bangladesh. In 1981, there were only 15 signalized intersections and another 15 were proposed in the Integrated Urban Development Plan. Prior to 1977, RAJUK was responsible for signal installation and control. In the early 1980’s control of signal was transferred to Police Traffic Division with RHD engineers assigned to help. This experiment lasted only a year before signals were reassigned to DCC. In year 2000-2001 DUTP has installed 9 Halogen type traffic signals in Newmarket-Mirpur road. After that in year 2004 by the fund of World Bank Dhaka City Corporation has installed four types of traffic signals at 59 intersections along the major corridors in Dhaka. At present there are 70 signalized intersections in Dhaka City. To identify the physical and operational deficiency of traffic signal system in Dhaka City. Study on the Standard Signal System and Comparison with the Standards. Condition & Maintenance of Existing Signal. Auxiliary Traffic Signs and Other Control. Present Operational Condition: Timing & Phase Control. The research includes the investigation of traffic signaling system and their deficiencies. The investigation was accomplished mainly in Dhaka metropolitan area; particular emphasis has been made on the Dhaka city corporation area comprising 135 approaches 0n 36 intersection. A detail literature review is discussed in this chapter to get the basic understanding of the overall traffic signal system. This chapter also contains a description of former research works on traffic signal and signal deficiencies in Dhaka metropolitan city. A brief review of historical and present development traffic signal in Dhaka and policies in Bangladesh are also provided. Regulatory Signs. These signs give orders. They tell drivers what they must not do (prohibitoiy) or what they must do (manthtory). Most of them take the form of a circular disc, although two signs, the Stop sign and the Give Way sign, have distinctive individual shapes. Warning Signs. These warn drivers of some danger or difficulty on the road ahead. Most of them take the form of an equilateral triangle with point upwards. Information Signs. Most of these signs give drivers information to enable them to find their way to their destination. It is a varied group of signs, but they are all either square or rectangular in shape. Octagonal sign with red background indicating stop and give way. This sign is used adjunctions where visibility is poor or it is unsafe for vehicles to enter the junction without stopping. It can also be used at rail crossings with no barriers where the visibility is very restricted. The sign instructs drivers to bring their vehicles to a complete stop and not proceed until it is safe to do so. Supplementary plate D7 must be added until the new signs have been in use for five years. The sign should be sited on the left hand side 1.5 meters in advance of the Stop line. Circular sign with blue background and a red diagonal line from top left to bottom right indicates no “parking” of any vehicle is allowed. “Parking” means keeping a vehicle stationary for any time longer than is necessary to pick up or set down persons or to load or unload goods. The sign is displayed on the side of the road to which it is applicable. The sign should be repeated at each major junction and at 200 meter intervals between junctions. Edge of carriageway road marking which indicates that parking is prohibited. It is a continuous yellow line 100mm wide. Where additional emphasis is required the line thickness should be increased to 1 50mm. This edge marking is used where parking needs to be prohibited because it would obstruct traffic or be hazardous. On rural roads it should be used where parking would be very hazardous, such as sharp bends and the approaches to narrow bridges and road humps. In these situations the line should be 150mm wide and should extend for at least 30 metres either side of the hazard. In urban areas the marking can be used to prevent parking that would cause obstruction or interfere with visibility, such as in or near junctions. Al 8 No Parking signs may be used with the marking, but this is not essential. In urban areas it is recommended that the line be marked on the kerb face, as this reduces wear and avoids the line being obscured by road dirt. Otherwise the line should be marked about 250mm out from the kerb. On rural roads the line is marked at the edge of the carriageway. Circular sign with two red diagonal lines crossing at right angles to each other indicating that “stopping” is not allowed.“Stopping” means keeping a vehicle stationary for the time needed to pick up or set down persons or to load or unload goods. This sign demarcates the areas where stopping and waiting is not allowed. It is used in urban areas where it is essential to ban vehicles from stopping, e.g., on heavily-trafficked or high-speed roads where stopping would cause congestion and accidents. Circular sign with right turn arrow overlaid by a red diagonal from top left to bottom right indicating no right turn. Where turning right into a side road at ajunction is prohibited. This normally occurs where either the side road is one way in the opposite direction or vehicles waiting to turn right would cause traffic congestion. The sign should be displayed before the junction and be positioned on the left hand side of the road for a single carriageway. On a dual carriageway the sign should be put on the median. At signalized junctions a 300mm diameter sign should be mounted alongside and to the right of the green signal. Circular sign with left turn arrow overlaid by red dif .g ial from top right to bottom left indicating no left turn. Where turning left into a side road at a junction is prohibited. This will normally occur where the side road is one way ir the opposite direction. The sign should be displayed before the junction and be positioned on the left hand side of the road. At signalized junctions a 300mm diameter sign should be mounted alongside and to the left of the green signal. Circular sign with U turn arrow overlaid by red diagonal from top right to bottom left indicating no U turns. Where it is prohibited for vehicles to reverse their direction by making a U turn. This will usually be because the man oeuvre is dangerous or will cause congestion, such as at a gap in the median on a high-speed road, or at a busy junction. The sign should be sited on the left hand side of the road at the point where the turn would be made. On a dual carriageway the sign should be positioned on the median. At signalized junctions a 300mm diameter sign should be mounted alongside and to the right of the green signal. White arrows with single or multiple heads indicating direction. It is recommended that these markings be reflectorised. The 6 meter arrows should be used on roads where the traffic speed exceeds 60 km/h. Arrow markings are used to indicate to drivers which lane they should take when approaching a junction. No more than two directions can be shown on one arrow. There are usually two arrow markings per lane. Where lanes approach stop or give way lines one arrow will be 15 meters from the line and the second will be a further 30 meters away. Where 6 meter arrows are used the distances should be increased by 50%. Broken longitudinal white line 100mm wide along the centre line of the road. Lane lines have a 1.5 meter mark followed by a 4.5 meter gap in urban areas and a 2 meter mark followed by a 7 meter gap in rural areas. Where additional emphasis is required the line thickness should be increased to 150mm. This line is used to divide the carriageway into traffic lanes. On a two lane road it is used as a centre line. It is essential for traffic safety, and must be marked on every two-way road that has a carriageway width of 5.5 meters or wider. Road authorities should give priority to keeping these markings in good condition. The lane line marking is used on all roads with a width of 5. 5 metres or wider. Pedestrian crossings controlled by traffic signals are marked by two 100mm wide broken white lines at right angles to the traffic flow with a 500mm mark and a 500mm gap. The width of the crossing will generally be 2500 with a maximum of 5000 for a particularly busy crossing. The pedestrian crossing is controlled by E6 type pedestrian signals which work with El signals for the control of vehicles. They are mostly used at signalized junctions. They can also be provided away from junctions at places where large numbers of pedestrians have to cross a heavily-trafficked road, but drivers and pedestrians may ignore them unless a policeman is present. The crossing must be sited as close as possible to where most pedestrians want to cross. Pedestrian guardrail may be needed to channel pedestrians to the crossing. Drivers must be able to see the crossing from at least 75metres away (100 metres on roads with traffic speeds greater than 50 km/h) and the use of B 17 Traffic Signals signs should be considered if the visibility is marginal. Pedestrian signals for controlling pedestrian crossings. The signal sequence is RED, GREEN, FLASHING GREEN, and then back to RED. Pedestrian signals can only be used in conjunction with traffic signals. Signal controlled pedestrian crossings may be appropriate where traffic speeds are high or where pedestrian flow is very heavy. However, drivers and pedestrians may not respect the signals unless a policeman is present. Crossings with pedestrian signals can also be incorporated into junctions controlled by traffic signals. The stop line is a continuous white line 400 mm wide at right angles to the flow of the traffic. It is recommended that all stop lines be reflectorised. This line is used wherever there is an Al Stop sign,an E5 rail crossing signal, or ajunction controlled by traffic signals. The line normally extends from the edge of the road to the centre line, but, if this distance is less than 2.75 metres, the line should be extended across the full width of the road. The stop line will normally be marked in line with the edge of the through road carriageway. A stationary vehicle at the stop line will then be in the best position to see in all directions at the junction. The stop line can be up to 1.5 metres before the edge line if there is a risk of collision with through road traffic (see F 10 diagram). At traffic signals the line is normally located 1 metre before the signal. Figure 6 in Section F shows the use of a stop line at a signalized junction. a) Signal Aspect: An optical system which produces a light output of specified size, color, shape and quality. b) Signal Face: A combination of signal aspects which together produce a continuous sequential display of light outputs to convey control information to road users. c) Primary Signal Face: Signal faces which are located at the stop line of an approach road at an intersection. d) Secondary Signal Face: Signal faces which are located across the intersection area. e) Signal Head: An assembly of one or more signal faces, mounted on a single support system. f) Vehicle Signal Faces: Signal faces providing control information to vehicle drivers. g) Pedestrian Signal Faces: Signal faces providing control information to pedestrians. h) Phantom Effect: A reflection of sunlight or sky light from the internal optical surface of the signal aspects (normally the reflector) to give a false indication that the signal aspect is lighted. i) Spectral Reflection: Reflection of sunlight and sky light from the outer surfaces of the optical system of the signal aspects, either the lens surface or stencils used for defining the symbol displayed. Thus masking the light display. a) Each vehicle signal face shall, unless otherwise specified, contain five aspects, arranged vertically on a vertical support or horizontally on an overhead mast arm. In the vertical arrangement the upper most aspect shall be red, the second lower aspect shall be amber, the third lower aspect shall be left green arrow, the fourth lower aspect shall be straight green arrow and the lowest (fifth) aspect shall be right green arrow. In the horizontal arrangement, the right most aspect shall be red, followed by an amber aspect, then by the right green arrow, straight green arrow and last by the left green arrow. All aspects on each vehicle signal face shall be of 300 ± 10 mm diameter. b) Primary vehicle signal faces shall be placed at the following locations. footpath at the stop line of an approach road. ii At normal height on the mast arm pole located on the central median at the stop line of an approach road. iii Overhead (5.5 m above road level) on the mast arm of the pole located on the central median at the stop line of an approach road. a) Pedestrian signal face shall contain two aspects arranged vertically. The aspects shall be circular with a diameter of 200 ± 5 mm. The upper aspect shall show a standing red man on a black ground while the lower aspect shall show a walking green man on a black ground. b) Pedestrian signal faces shall be placed at the following locations. i. At normal height on the standard pole located on the left footpath at the stop line of an approach road. ii. At normal height on the standard pole located on the right footpath at the stop line of an approach road. 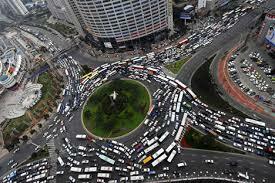 In Dhaka city total seventy signalized intersections exist which are divided into 253 approaches. (Rahman & khadem 2012). Certain guidelines are mentioned in the traffic signal positioning in the Traffic Signs Manual and also specifications in Contract Package No. (G) ETSS1, “Supply and Installation of traffic Signals in Dhaka City” . As per the sign manual shown in Figure 2.13, signal positioning should be at cross roads, the traffic signal should be placed 1 meter ahead of the stop line. Besides, position of signal for each approach should be sited on the left-hand side at the entrance to the junction. If the approach is more than two lanes wide a second primary signal may be needed on the right-hand side and where necessary, a traffic island must be built to accommodate it. The survey conducted on every signalized intersection and approaches of the signalized intersection. According to the specification, “Supply and Installation of traffic Signals in Dhaka City” Lamp and lamp drive faults shall be monitored to ensure that the switching of each phase aspect corresponds to the drive signals from the controller. Traffic signal Light directions should be facing the flow traffic so that divers can easily understand it and can take decision quickly. Due to the traffic signal’s wrong positioning of signal light, the drivers are confused to take decision at intersections. This leads to unsafe driving conditions. Stop lines must be located to facilitate movements by vehicles turning from other streets. whenever it is important that a vehicle should stop further from an intersection than is customary, The signal faces for that approach should be located so that vehicles are kept at the proper stop position. Due to absences of markings, drivers do not follow the traffic rules, such as due to absence of stop line drivers stop the vehicle in front of pedestrian crossing, as result drivers can not see the signal and also pedestrian facing difficulties to cross the road. Pedestrians cross the road as their wish at intersections and thus occur conflicts between vehicles and pedestrians that effects on safety and also increase delay. If the traffic signs are absent in intersections, it affect pedestrians’ and motorists behavior. The awareness of both pedestrians and motorists decreases due to the absence of traffic sign. As a result, it does significant influence on safety. The absence of a sign is one of the reasons for driver responsibility failures. It is impossible to correct driver right-of-way misconceptions or violations as the absence of a traffic sign. When stop sign is not present, cross traffic does not stop at intersection. Kill and seriously injurious of all road users is increased in road traffic. It is not possible to inform road users about traffic laws or regulations and to warn about hazardous condition ahead where traffic sign is absent. There is no guidance for the road users along route to reach their interest point with easily, conveniently, and safely due to absence of traffic sign. Footpath is necessary at signalized intersection for pedestrians. Pedestrians wait in footpath near the pedestrian crossing at signalized intersection when the traffic flow occurs. Footpaths are safe, convenient and easy to use. Median provides traffic safety, functional integrity of the road. It helps for the access management. Median physically separate opposing traffic Streams and help stop vehicles traveling into opposing traffic lanes. It allows space for speed changes, storage of right turning and U-turning vehicles. Median barriers used as ‘safety barriers’ (designed to safely stop or redirect vehicles that hit them) are usually stronger than median barriers used mainly to direct traffic flows or discourage pedestrians from crossing. They are often built on the centre of wide urban multi-lane roads where they can be used to stop pedestrians crossing the road at unsafe places. According to sign manual auto signal control should be maintained. In Dhaka city three types of signal lights are usually used. When the Red light is on vehicles must stop and wait behind the stop line. In green time vehicles may proceed past the stop line and may turn in any direction, subject to the normal priority rules being observed, and provided that the turn is not prohibited by another light signal or a regulatory traffic sign. Yellow light on means that vehicles must stop at the stop line unless they are so close to the stop line that they cannot stop safely . The method of conducting study and the detail data collection procedures are discussed in this chapter.. In this chapter the overall research methodologies that have been followed to achieve the objectives. Times of data collection, data collection procedures, analysis and the outlines of the study are described. A comprehensive literature is review undertaken and information is collected from various sources. Information was also collected from the concerned organizations such as Dhaka City Corporation (DCC), Dhaka Metropolitan Traffic Police (DMP), Rajdhani Unnayan Kartipakha (RAJUK), Bangladesh Road Transport Authority (BRTA), Dhaka Transport Coordination Board (DTCB). In order to identify the physical and operational deficiency detail field survey was conducted in36 intersection of Dhaka City. The survey data are collected and analyzed with two major observations: existing physical conditions and operational qualities. The physical conditions of the selected intersections which are covered include position of the signal, signal light condition, signal light visibility, relevant traffic sign and marking, intersection clearance, i.e. sight distance, footpath at intersections bus stoppages; pedestrian crossing facilities, pedestrian signal etc. On the other hand, the operational qualities such as phase, cycle time, timing control at the approaches,etc are surveyed. The details of the primary data collection procedure are discussed in the following section. As it is stated in the earlier section that different types of data have been collected from the field survey conducted in the selected intersections Preliminary survey was conducted at 36 signalized intersections in Dhaka City from 03-04-2012 to 13-05 2012 . Detail survey is carried out during different days of month and at different times of 36 the signalized intersections in Dhaka City from 25- 11-2012 to 25-01-2012 to obtain representative data. After the collection of the data from various sources, all data have been analyzed by using Excel software. In this chapter, detail methodologies followed in the research are presented. The survey, data collection and the analysis process for identifying the deficiencies discussed briefly Subsequent chapters deal with identification of deficiencies and important findings from the analysis. This chapter deals with the identification investigation of on physical &operational deficiency qualities of traffic signal 0n 36 intersections in Dhaka city. Physical deficiency such as signal light, traffic sign and marking, pedestrian signal visibility etc are described. Also the operational deficiency such as signal light condition, lane discipline, following of signal light, stop line & pedestrian crossing violation, illegal parking etc are described. The investigation of the selected parameters regarding physical and operational qualities on the intersections are first summarized and then these are compared with the standards or guidelines discussed in chapter 2. The existing conditions of the intersections are described in the following sections. In figure 4.1, signal positioning is five meter ahead from stop line at east approach of sadargate intersection; here signal is set in front of the pedestrian crossing which became barrier to trespass and is not compliant according to the manual. Table-1 shows the data on placement of signal at different intersections and their respective percentages .Out of 135 approaches the signal positioning is wrong at 40 numbers or 29.62 percent approaches and at 1number or 0.74percent approaches there is no signal found. Out of 36 intersections 13 numbers or 36.11 percent intersections the traffic signal was not placed correctly. In most of the cases, signals are placed in front of the pedestrians crossing and too far from the stop line. The drivers have a tendency to stop the vehicle near the signal and they stop the vehicle in front of the pedestrians crossing. For these pedestrians can not use the crossing location, they are crossing the road at intersections which causes conflicts between vehicle & pedestrians and also occurs delay. Besides the signal set back is reduced in junction that makes difficulties for turning movement of large vehicles. In case of placing the signal behind the stop line drivers stops the vehicles in front of the signals and that situation they cannot see the signal lights. Traffic signals that are wrong positioned should be replaced according to the manual, as described in chapter 2, as one meter ahead from the stop line and behind the pedestrian crossing. For controlling of traffic the signal lights should be maintained well. Signal light are not monitored perfectly. Signal light are found not to be monitored properly. Signal light is missing at 0.73% approaches and at 2.77 % intersections. From the survey data, it is found that signal light direction is wrong at 19,45 percent approaches and at 80.55 percent intersections. In the table no stopping sign is presence/yes only at 3 numbers or 2.20 percent of approaches and 1 numbers or 2.77 percent of intersections. No stopping sign is absent at 132 numbers or 97.05 percent approaches and 35 numbers or97.22 percent intersections. No pedestrians sign is presence/yes at 1 numbers of approaches. From table, out of135 numbers of approaches, No rickshaws sign is present at 7 numbers of approaches. From table, out of 135 numbers of approaches, No parking sign is present at 29 numbers of approaches which is not enough to provide smooth flow of traffic. No parking sign is absence/no at 107 numbers of approaches where adequate number or percentage of this sign should be required as busy street or too close to a major junction in Dhaka city. From table No stopping sign is presence/yes at 29 approaches. No stopping sign is absence/no at 106 numbers of approaches whereas it should be provided in sufficient quantity as required places to prevent congestion & accidents. No right turn is used where turning right into a side road at a junction is prohibited. In table, No right turn sign is presence/yes at 7 numbers approaches .No left turn is used where turning left into a side road at a junction is prohibited. No left turn sign is presence/yes at 0 number of approaches and 0 number of intersections, which is according to their requirement in heavily trafficked road. No U turn sign indicates any vehicle cannot take u-turn. No U turn sign is present/yes at 7 numbers of approaches.. In figure 4.8: a) Stop line, Signal controlled Pedestrian crossing, Lane line, No parking, Traffic lane arrows are absent in Mohakhali intersection. In figure-4.8: b) Stop line, Signal controlled Pedestrian crossing, Lane line and No parking are faded at Gulshan- 2. From Table-4.6 Stop line is present at 39.25 percent approaches and 11.11percent of intersections where it should be present at all approaches or intersections. Stop line is faded at 4 numbers of approaches or 2.96 percent of approaches and 4 numbers or 11.11 percent of intersections where it should be clear to see. Stop line is absent at 78 numbers of or 57.77 percent approaches and 28 numbers or 77.77 percent of intersections, which is unacceptable. From Table-4.6 Pedestrian crossing marking is present at 31.85 percent approaches and 5.55 percent intersections. Pedestrian crossing marking is faded at 10 numbers of approaches and 8 numbers of intersections. Pedestrian crossing is absent at 82 numbers of approaches or 60.74 percent approaches and 72.22 percent intersections. From Table-4.3 Pedestrian crossing marking is present at 31.85 percent approaches and 5.55 percent intersections. Pedestrian crossing marking is faded at 10 numbers of approaches and 8 numbers of intersections. Pedestrian crossing is absent at 82 numbers of approaches or 60.74 percent approaches and 72.22 percent intersections. Table-4.4 Lane Line is presence at 46.66 percent approaches and at 11.11 percent of intersections where it should be present on all roads of which width is 5.5 meters or more. Line is absent at 48.88 percent approaches and 72.22 percent intersections. Lane Line is faded at 6 numbers approaches and 6 numbers or 16.66 percent intersections. From Table-4.4 No parking is present at 25.18percent approaches and 0 percent intersections where it should be used in every approaches or intersections at urban areas. No parking is absent at 74.81 percent approaches and 100 percent intersections where absence of no parking is not possible at signalized intersections to prevent parking that cause obstruction or interfere with visibility. Table-4.14, Traffic lane arrows are present at 25 numbers approaches or 18.51 percent approaches and 1 numbers or 2.77 percent intersections where it must be placed in all signalized intersections. Traffic lane arrows are faded at one number of approaches and 1 numbers intersections where it should be clear to see for the drivers. Traffic lane arrows are absent at 80 percent approaches and 91.66 percent intersections. From survey, marking of Special Speed limit, Lane for Cycle & Rickshaw are not found at any approaches and intersections. Footpath is present at 99.25 percent intersections. Footpath is not found at 0.74 percent intersections. The existing footpath condition is poor. Footpath is broken at 37 numbers or 27.40 percent approaches and 20 numbers or 55.55 percent intersections, are shown in table 4.6.1. For these types of problem, pedestrian feel discomfort to use footpath and are forced to walk at intersection (figure 4.12). From survey median is present at 97.03 % intersections and 94.44 % approaches. Besides the existing median are also broken in some intersections. Median is broken at 5.55 percent intersections. From table-4.6 Tree is yes (exit) at 13 numbers approaches or 9.62% approaches. Cable in front of signal light is yes/exist at 6 numbers approaches or 4.44 % approaches, no (not exit) at 129 numbers of approaches or 95.55% approaches. Electric pole is yes/exist at 3numbers of approaches or 2.22% approaches. There is no signal found at 131 numbers or 97.03% approaches. The clear view is yes/exist at 34 numbers or 94.44% intersections, no (not exit) at 2 numbers or 5.55 % intersections. Building or structure is yes/exist at 0 numbers of intersections or 0.00% intersections. Signboard or bill board is yes/exist at 9% numbers of intersections or 6.66% intersections. Tree is yes/exist at 12 number of intersections or 33.33% intersections, no (not exit) at 24 number intersections or 66.66% intersections. Cable in front of signal light is yes/exist at 6 number intersections or 16.66% intersections, no/ not exist at 30 numbers intersections or 83.34% intersections. Electric Pole is yes/exist at 3 numbers of intersections or 8.33% intersections, no (not exit) at 33 numbers of intersections or 91.66 % intersections. In table 4.13 Signal light is blinking at 10 numbers or 9.07 % approaches and 4 numbers or 11.11 % intersections. In table 4.14 signal lamp is clean/ok at 128 numbers or 94.81% approaches and 33 numbers or 91.66 % intersections. Signal lamp is dirty at 6 numbers or 4.44 % approaches and 3 numbers or 8.33% intersections. Signal light is off at 91.66% off intersections; Signal light is blinking at 11.11% intersections, signal is not clean at 8.33% of intersections. In Dhaka City, the overall road traffic management is assigned to Dhaka Metropolitan Police (DMP). Hence, often the signal operations, i.e. phase and timing control etc are controlled by Police in a non-engineered way. Police personnel are usually in the lack of proper knowledge about traffic engineering, signal timing design and effective signal operation. In any country, the road traffic regulations or management is planned by the transportation specialists and an implementation body is equally important to enforce the planned laws and regulations. But, in Bangladesh, both the responsibilities are assigned to DMP without or at most with a little training on traffic regulations. As a result, the true signal operation is often hampered and the traffic police plan and allocate phase, cycle or signal timing manually and inefficiently among the approaches (state some of the historical development of traffic signal in Dhaka city referring to chapter 2 and then add the following lines) The signals, which were installed in different road intersections of Dhaka city, were based on fixed-time approach. As stated in chapter 2, this approach is a very conventional yet comprehensive and effective system of signal system. Since this effective method has failed to be warranted in most of the roads of Dhaka, it is actually an economic loss for the state due to the earlier installations of pre-fixed signal systems and even more due to present scattered traffic delay. It also restricts further advancement in traffic signal system which is prevailing successfully in developed world, because the existing condition simply does not warrant the more sophisticated intersectional management. Under the present situation, start-up lost time for vehicles is increased and delay is raised. In figure 4.43 traffic policeman is indicating by hand manually to stop the traffic at Banglamotor intersection. Traffic police control traffic manually by hand at 35 numbers or 100% intersections. Auto signal runs at 3 numbers or 8.33 % intersections. Both auto signal and police control by hand at 3 numbers or 8.33% intersections. Timing control in controller by police at 36 numbers or 100 % intersections and by DCC at 0 numbers or 0 % intersections. Huge numbers of police staffs (126 persons) work everyday for signal timing control manually in Dhaka city. Random and scattered timing/phase control manually . This chapter present the major findings of the study. Effect due to deficiencies of signal system and recommendations for improving the situation are also discussed in this chapter. From this study lots of physical and operational deficiencies are observed in traffic signal system. Ineffective operation, maintenance and monitoring of traffic signals may have safety implications and contributes annually to millions of hours of unnecessary traffic delays, congestion. Management practices, availability of a mission statement and annual review are absent in Dhaka City. For the deficiency of traffic control device road traffic violation increase and these are affects on safety. The corrective measure should be taken to mitigate deficiencies. This should be feasible and relevant for improve the situation. In general, the main objective of the study, as stated in chapter 1, was to investigate the reasons behind the non-warranted condition or failure of the traffic signal system in Dhaka city by identifying the existing deficiencies. Although the conventional traffic signal system exists in many of the major road intersections, the true implementation is not exercised and hence a very effective traffic supply management tool is undermined. The underlying reasons are the major findings of this study which are identified as the two primary kinds of deficiencies, i.e. operational and physical deficiencies. It has been observed from the survey data and other analyses in the previous chapter that the both the operational and physical conditions are equally responsible for the overall failure of the signal system. The placement of signal is wrong at 29.62% approaches and at 63.88% intersections. Due to wrong placement of signal the pedestrians are confused to cross the road at intersections. Sometimes drivers are facing difficulties as they can not see the signal light. For long vehicles turning is not easy at intersections as the sat back is reduced. Signal should be placed at correct location and should follow the standards or manuals. It should be placed one meter ahead from the stop line and behind the pedestrian crossing. The traffic signal light is broken or missing at 2.77 % intersections and 0.73% approaches. For this reason traffic hazard is increased and it is difficult to manage traffic flow at intersections. The broken signal lights should be repaired immediately. Signal Light direction is wrong at 5.18% approaches and at 1.94% intersections. Therefore the drivers are confused to take decision at intersections. This leads to unsafe driving conditions that have an effect on safety of road users. The traffic signal light direction must be correct and to the flow of traffic stream. No rickshaws sign is present at 7 numbers approaches, No parking sign is present at 29 numbers approaches, No stopping sign is present at 29 numbers, No right turn sign is present at 7 numbers approaches, Pedestrian crossing sign is present at 1 numbers. No U turn sign is present/yes at 7 numbers of approaches. The numbers of signs provided at approaches are very few. Sufficient numbers of traffic control signs should be provided to guide motorists. Stop line is absent at 57.77% approaches and at 11.11 % percent intersections which is unacceptable. Pedestrian crossing is absent at 60.74 % approaches and at 72.22% intersections. Lane line is absent at 48.88% approaches and at 72.22 % intersections. No parking is absent at 74.81 % approaches and at 100 % intersections. Traffic lane arrows are absent at 80 % approaches and at 91.66 % intersections. Special Speed limit, Lane for Cycle & Rickshaw marking are not found at any approaches and intersections. It is necessary to provide required pavement markings at intersections to guide the road users and also to maintain the signal system, reduce delay and hidden violation. Respective persons should take countermeasures such as to provide as required no. of signs, markings at signalized intersections. Pedestrian signal is 0ff at 78.51% approaches and36.11 % of intersections. Due to wrong placement of pole pedestrians cannot see the signal light and are confused to cross the road which is very dangerous and also has no benefit to pedestrians. Pedestrian signal should be placed correctly so that they are easily visible to pedestrians. For these reason pedestrians are misguided and adverse effects on safety. Broken Pedestrian signal head should be repaired. The existing footpath condition is poor. Footpath is broken at 37 numbers or 27.40 percent approaches and 20 numbers or 55.55 percent intersections. Footpath, median, pedestrian refuse. Traffic signal lights are not visible due to obstruction. Obstruction such as building or structure at 1% intersections, Signboard or bill board at 25% intersections, trees at 33.33 % intersections, Cable in front of signal light at 16.66 % intersections, Electric Pole at 8.33 % intersections exist in front of signals. Due to obstructions in front of traffic signal lights, driver can not see the signal lights properly and they can not take decision at intersections. As a result conflicts and driver errors increase. Approach treatments is required to remove the obstructions such as Structure, signboard, tree, cable, electric pole etc in front of signals. These improve signal visibility that will aid drivers in making decisions at the intersections and forewarn them of a signalized intersection. Lane discipline is absent at 97.22 % intersections. Due to lack of lane discipline saturation headway, lost time, effective green time are difficult to measure and is not properly justified. For this reason signal timing provided in controller does not satisfy to the actual demand. Stop line is violated at 98.51 % approaches and at 94.44 % intersections. Pedestrian crossing is violated at 83.70 % approaches and at 91.66 % intersections. Illegal parking is found at 58.33 % intersections and bus stoppage at 63.88 % intersections. Due to parking at intersections capacity is reduced and vehicles cannot pass the intersection freely during green time. These are affects on traffic queue dispersion in the green time and increase delay. Enforcing the drivers to obey the rules is necessary. Signal light is off at 33% intersections, Signal light is blinking at 4% intersections, signal is not clean at 3 % intersections. The Signal light should be maintain properly. Pedestrian signal head is dirty at 11% approaches and at 30 % intersections. Pedestrian signal light are off at 62% approaches and at 84% intersections. No signal is found at 20% approaches and at 4% intersections. Pedestrian signal face is not clear at 67% intersections. For these pedestrians are confused to cross the road. They cross the road at any time even in green time during the traffic movement. These have an effect on safety and also increase delay. Pedestrian signal should maintain well and workable to provide safety for the pedestrians and reduce delay. Maintenance response time for failure repairing is not good and also there is no ability to automatically detect the failure. It is necessary to improve the capabilities. Maintenance is required to improve security, safety of traffic signal. Persistent monitoring of the traffic signal system is necessary. Adequate staffing for maintenance of traffic signals is necessary. DCC should have own technician for maintaining the traffic signal. Traffic control at special events and incidents are absent. Alternate signal timing plans for incidents or special operations are required. Video or visual dynamic message boards are programmed to inform motorists of the incident and possible diversion. This study has not covered an extensive survey for the very sophisticated modern methods of traffic signal systems that are practiced in developed world, because the very conventional fixed time system yet could not be warranted in Bangladesh. But these methods, i.e. automatic, adjusted signal, VMS system etc, can also be investigated in future once the physical deficiencies are amended. The design of the fixed time signal system for a representative signal could have been done. But this is out of our scope since we have emphasized more on finding the existing deficiencies. Regional operations collaboration and coordination activities should increase between transportation and public safety agencies such as, Police, DCC, DMP,BRTA. Adequate policies should be taken for signal system. It is needed to Consult with stakeholders and formulate countermeasures. In Dhaka City the centralized control should be started by solving the technical problems such as GSM network, modem establishment, equipment fixing and replacement etc. The TMC can be established and the staffs for TMC should be deployed and should get sufficient training with hand-in experience. Also TMC should be connected with traffic wireless system, traffic surveillance system, traffic signaling system, traffic help line, traffic planning operations, etc. All the identified signal deficiencies in this study must be amended in order to make the currently collapsed traffic signal system warranted. The efforts of the current study have attempted to begin a thought regarding this sector of traffic management in Bangladesh. With the data that has been collected on Moghbazar intersection, one can design a fixed time signal system once the deficiencies are overcome. Hossain M. (2004), “Shaping up of urban transport system of a developing metropolis in absence of proper management setup: the case of Dhaka”, Journal of Civil Engineering (IEB), Volume- 32 (1), page 47-58. ICB for Contract Package No. (G) ETSS1, “Supply and Installation of traffic Signals in Dhaka City”, Dhaka Urban Transport Project. Hadiuzzaman M. (2008) “Development of Saturation Flow and delay models for signalized intersection in Dhaka City”, M.sc Thesis, Department of Civil Engineering, Bangladesh University of Engineering and Technology(BUET), Dhaka ,Bangladesh. Hasan M (1996) “Traffic signal design of isolated intersections for mixed trafficoperation.” M.sc Thesis, Bangladesh University of Engineering and Technology. Alam Sarwar. M, (1997), “Performance evaluation of selected signalized intersections in Dhaka City”, M.E Thesis, Department of Civil Engineering, Bangladesh University of Engineering and Technology(BUET), Dhaka ,Bangladesh. Imran. Asif M.(2006), “Traffic signal design and modification of Webster’s delay formula under non-lane based heterogeneous road traffic condition” B.sc. Thesis, Department of Civil Engineering, Bangladesh University of Engineering and Technology(BUET), Dhaka ,Bangladesh. Hossian, A. B. (1996), “Effect of Non-Motorized Transport on the Performance of Rod Traffic in Metropolitan Dhaka.” M.Sc. Thesis, Department of Civil Engineering, Bangladesh University of Engineering and Technology(BUET), Dhaka ,Bangladesh. Bhuiyan,M. H. (2006), “Study of Transport Deficiencies at Kalabagan Area of Dhaka City”, B.sc in Civil Engineering, Department of Civil Engineering, Bangladesh University of Engineering and Technology(BUET), Dhaka ,Bangladesh. Traffic signal design guide & timing manual (November 2007), Alabama Department of Transportation by The University Transportation Center for Alabama. General traffic engineering studies (November 2007), General traffic engineering studies, Chapter 43. Traffic Signal Operations and Maintenance Staffing Guidelines (March 2009), Federal Highway Administration, U.S. Department of Transportation, Dunn Engineering Associates, P.C. Highway Traffic Manual (December 2009), part 4, 2009 edition, pp 433-530.